Every fall, ITS releases an annual report that covers the previous fiscal year and shares our technology upgrades and achievements. Annual reports includes stories, videos and stats on ITS’ projects and work. 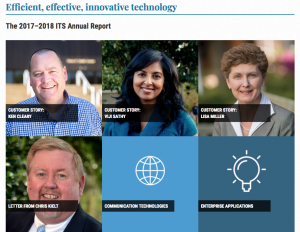 The 2017-2018 Annual Report highlights our organization’s focus on efficient, effective and innovative technology and how it enables our customer success. In addition to stories about all of ITS’ units, the report showcases 18 customer stories and testimonials about their use of our services and support. 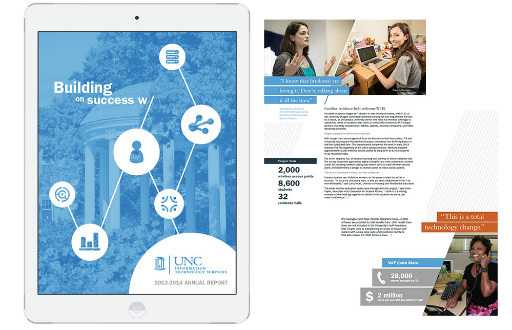 The 2017-2018 Annual Report utilizes WordPress, the University’s central content management solution. The 2016-2017 Annual Report focuses on collaboration and celebrates the accomplishments of the past year. Collaboration is fundamental to our success as an IT organization and it is only through working with our customers and engaging with partners that we continue to grow and improve the services that we offer to the community. 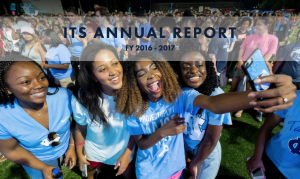 The 2016-2017 Annual Report utilizes Adobe Spark technology, part of Adobe Creative Cloud suite now available for all students and instructional faculty on campus. During 2015-2016, ITS placed a strong focus on service, and that emphasis on service manifested itself in many forms. In this annual report, read stories, watch videos and check out stats on such technology improvements and initiatives as new high-end compute clusters, a new Wi-Fi network, server consolidation and community collaborations to increase fiber connectivity. Our 2014-2015 Annual Report, Strengthening the Core, Building for Tomorrow, features videos, slideshows, interactive graphics and more. Read about our upgraded classroom technology, firewall upgrades, HelpDesk stats, ConnectCarolina go-live and more. 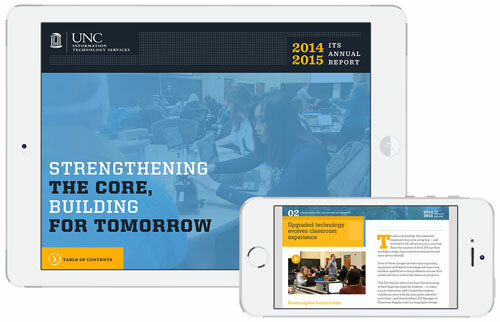 The report is optimized for viewing on tablet devices, but will also work on phones. The 2013-2014 Annual Report, Building on Success, highlights projects and achievements of a year full of prep for a new ERP. It also highlights collaborations across campus with key stakeholders and partners. This annual report is available only for iOS tablet devices although a PDF is also available.